Here are some très feminine buttery buttercream biscuits that we think make a great gift idea and a sweet alternative to cupcakes! * To make the biscuit, beat the butter and sugar together in a bowl; add the egg yolk and vanilla essence and beat until the mixture is smooth. * Add the flour and salt and mix together to form a smooth dough, mould the dough and wrap it in cling film and leave in the fridge for 30 mins. * Heat the oven to 180C. 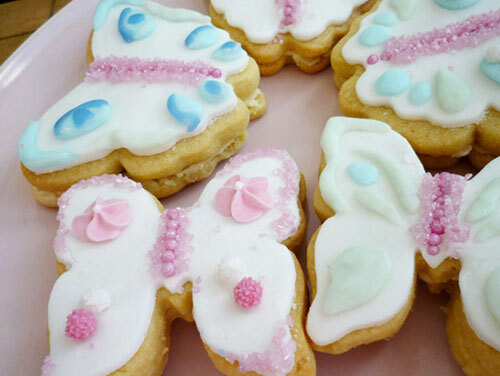 * Roll the dough to ¼ in thick and using the butterfly cookie cutter cut out 14 butterfly dough shapes and arrange on a greased baking tray. * Cook for 12 minutes or until golden and leave them to cool. * Decorate half the biscuits; roll out your white icing, use the butterfly cutter to get the same shape and place on top of the biscuit. * These can be put into a small cup cake box and wrapped in a ribbon bow to be given as a quirky and cute present for a birthday or thank you gift. Wow they are so pretty! Definitely going to try and make them!